FIDE website published rating list for December 1. Magnus Carlsen gained two ELO points after the world title match. Thus, he repeated his record of achieved in February-April. Other interesting thing is Veselin Topalov's improvement: now he is now 5th in the world leaving behind Grischuk and Caruana. The World Chess Federation has published its May 1st rating list. The biggest change in the men's list is Viswanathan Anand moving into second place with a rating of 2804. Magnus Carlsen's rating has also been raised due to his success in Shamkir - he is now at 2876, just six points below his own record. In third is Fabiano Caruana, with 2803. The last of the top ten is Levon Aronian on 2776. 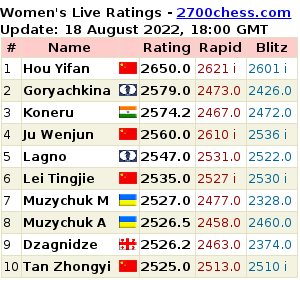 A new rating list has been published by FIDE. Magnus Carlsen and Vishy Anand are the only top players who haven't played a game this months. The world title match starts in nine days, at the moment there is 95 points difference between their ratings. Levon Aronian is back to 2800+ club. Next is Vladimir Kramnik with 2793 ELO points. The updated FIDE rating list for May has been published. The major news is that the updated list includes the results of the Zug Grand Prix which has finished just today. Earlier FIDE wasn't notable for such efficiency. Finishing first with 8/11 Veselin Topalov gained 22 ELO points. Now his rating is 2793 which made him the fourth player in the world after Carlsen, Aronian and Kramnik. FIDE rating list for December 1st has been published. Magnus Carlsen keeps the top position, but his rating dropped to 2834 - last time it had been lower than that four years ago, in November 2011. Meanwhile, the Women's World Champion Mariya Muzychuk flew up the list, being third for the first time in career. The official December rating list has been published on the FIDE website. The Sochi match almost hasn't influenced the ratings of its participants: Magnus Carlsen (2862) has lost 1 point in comparison to November, while Viswanathan Anand (2793) has gained the same amount. Soon after the New Year came according to Moscow Time, FIDE has published the rating list for January 1st. The top of the list wasn't surprising for those following live ratings: Magnus Carlsen has a record breaking 2861, Kramnik has 2810. 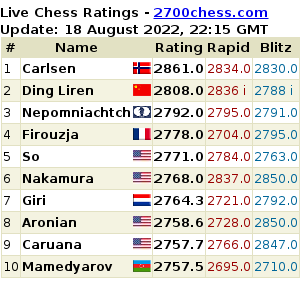 Levon Aronian is third with 2802 rating points, while Teimour Radjabov is fourth with 2793. Fabiano Caruana maintained 5th place with 2781. The World Champion Vishy Anand is 7th. The gold medal obtained by Kramnik with the Russian team at the World Championship cost him several individual ELO points. He moved to the 4th place in the rating list being surpassed by Hikaru Nakamura, who is now 3rd int he world. Topalov is 5th losing Kramnik only two points.Carlsen maintains lead with 2872 rating points. Check out the FIDE rating list for January, 2014. The official world rating list for November 2014 has been published at the official FIDE website. The top 10 hasn't changed much: Magnus Carlsen is #1 with 2863 Elo points, Fabiano Caruana is the 2nd with 2839 (the distance between him and Carlsen has increased a bit since October), Veselin Topalov is next to Caruana with 2800, and so on. The FIDE website has published the official October rating list, in which Fabiano Caruana is only 19 points behind Magnus Carlsen (2844 for the Italian vs 2863 for the world champion). Veselin Topalov has 2800 again as in good old times; he occupies the 3rd rank, while Alexander Grischuk who is the 4th still lacks 3 Elo points to enter the virtual 2800+ club. Levon Aronian went down to the 5th position, Vladimir Kramnik is only 11th. Vishy Anand continues losing rating points. He was surpassed by Teimour Radjabov in the rating list for July, while now he is behind Russian GM Sergey Karjakin. Radjabov maintained the 4th place with 2788 points, Karjakin is 5th - 2785, while Anand has 2780 points, Nakamura is 2 points behind with 2778 points.